I’m ecstatic to share that, as part of the Artists’ Archives initiative, I’m spending the next three months working as an intern in the Archives department at the Georgia O’Keeffe Museum Research Center in Santa Fe, New Mexico. The Georgia O’Keeffe Museum is a single-artist institution dedicated to the life and work of Georgia O’Keeffe (1887-1986). The art collection reflects O’Keeffe’s experience primarily in northern New Mexico, Texas and New York, comprising over 3,000 oil paintings, watercolors and drawings. 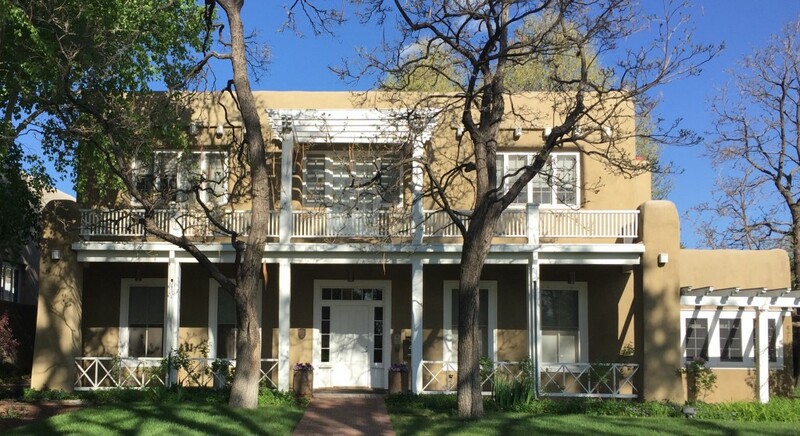 In addition to her art, the Museum also maintains two historic properties owned by the artist in Abiquiu and on Ghost Ranch, roughly an hour north of Santa Fe. The Museum recently opened an exhibition on Georgia O’Keeffe’s Far Wide Texas, part of the installation of Becoming A Modern Artist. Portions of the collections are also on loan to the Tate Modern for its upcoming exhibition Georgia O’Keeffe and The Harwood Museum of Art for its exhibition Mabel Dodge Luhan & Company: American Moderns and The West. Besides the Museum proper and the historic houses, the O’Keeffe campus (as the staff calls it) extends to the Education and Conservation departments, as well as the Research Center, which houses the artist’s Library and Archives. The relationship between Curatorial, the Registrar and the Archives is especially close-knit. Even the interns benefit from this team mentality; staff members throughout the campus have extended invitations for me to shadow them and join their interns for relevant events. As part of this, I will sit in on inter-department staff meetings, join both the Registrar’s interns and the library staff for cataloguing at the historic properties, tour the galleries with Curatorial’s drawing interns, and meet with the director of the Research Center for a glimpse into the planning for an upcoming forum for single-artist institutions. This year, the Museum focused the arrangement of its galleries around themes, which accommodates display of the personal effects of O’Keeffe, which are the purview of the Archives. Thus, Curatorial and Research Center staff are navigating a new relationship that fosters increased coordination of collections. As a nearly life-long fan of the art and aesthetic of O’Keeffe, I’m thrilled to act as a fly on the wall while the two departments work out the kinks, such as what to do if a researcher presents a compelling need for an archival item that’s being housed in the galleries, or if another museum requests the item for an exhibition. The scope of the Archives covers O’Keeffe’s life and artistic practice, American Modernism as it relates to O’Keeffe and her circle (including her husband Alfred Stieglitz), local histories relevant to O’Keeffe and her interests, and institutional history for the Museum. Currently, the Center’s archivist, Liz Ehrnst, is reviewing the collections development policy to tighten the scope even more on materials not just relating to, but significant to a deeper understanding of O’Keeffe and her artistic practice. 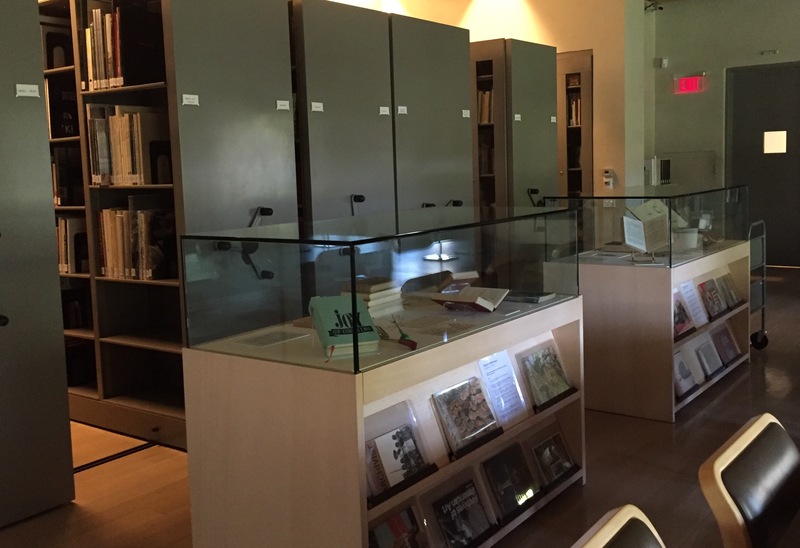 The Archive’s appeal extends beyond staff; scholars and visitors are welcome by appointment. In recent years, the Research Center—like many similar institutions—has relaxed its more stringent access policies, ones that accommodated only the most accredited scholars. In order to tour the display cases and drawers, one need only make a reservation (which I would highly recommend, since they’re focusing on O’Keeffe’s passion for cooking at the moment). And in order to conduct research, simply submit an application with your information and purpose for using the collection. Some scholars that produce significant work as a result of working with the archival collection donate their materials to the Archive. One such scholar is Jan Garden Castro, who wrote the book The Art & Life of Georgia O’Keeffe. As part of my internship, I’ll process her research papers, paying item-level attention to the interviews and other primary research conducted by Castro. O’Keeffe’s papers are also in process. I’ll be continuing work on O’Keeffe’s photos, exhibition history, travel ephemera, and correspondence. This week, I began working on the correspondence by reviewing and standardizing the transcriptions for the letters from O’Keeffe to Stieglitz. Once the transcriptions are ready to import into CONTENTdm—the host for the Archive’s online collection—the letters will be keyword searchable. Keyword searching is a powerful tool for scholars, making the large correspondence collection easier to navigate and reducing the need to browse the physical collection, which is hard on the letters and demanding of staff time. As mentioned previously, the current scope of the Archive includes materials belonging to those close to O’Keeffe. The Estate of Maria Chabot—a companion to O’Keeffe when she lived in New Mexico—recently donated Chabot’s library to the Archive. One of my tasks this summer is to inventory the remaining shelves of books, searching them for valuable annotations and inserted materials, as well as cross-checking them against the holdings in O’Keeffe’s library. Following standard gift procedure for archives, those books that relate to O’Keeffe and her interests will be incorporated into the collection, while those outside of the Archive’s scope will find new, appreciative homes where the books will be more relevant. and ArchivesSpace to internally manage the archival collection (data from Archivists’ Toolkit is currently migrating to this platform so that it can be the exclusive archives platform). One of my highest priority tasks is to test the current documentation noting the workflows for ArchivesSpace. The IT department is also looking into fostering a centralized documentation platform so that the institution maintains consistent documentation across all departments. Wiki pages are one avenue to explore. Wiki’s major advantage is that it’s accessible to everyone in the organization (unlike current project documentation) and that it’s linkable, which means that the documentation maintained in Dropbox, Google Drive, and other file share applications can simply be linked, rather than migrated to a platform unfamiliar to the users. This week I start researching options that might best serve the Museum’s needs—like Wiki—to write up a proposal for adoption. With the guiding themes of documentation and processing to direct my summer work, the internship at the Georgia O’Keeffe Research Center promises to be highly educational regarding how an institution might deal with the materials addressing every aspect of life and practice for just one artist. Such a refined focus will allow me to dig into these dealings with some depth, as well as breadth. Now that the first week here is under my belt, I’ll have more to report as time goes on. “About the Museum.” Georgia O’Keeffe Museum, 2016. https://www.okeeffemuseum.org/about-the-museum/. “Research Center.” Georgia O’Keeffe Museum, 2016. https://www.okeeffemuseum.org/research-center/; Elizabeth Ehrnst in discussion with Elizabeth Grab, May 10, 2016.